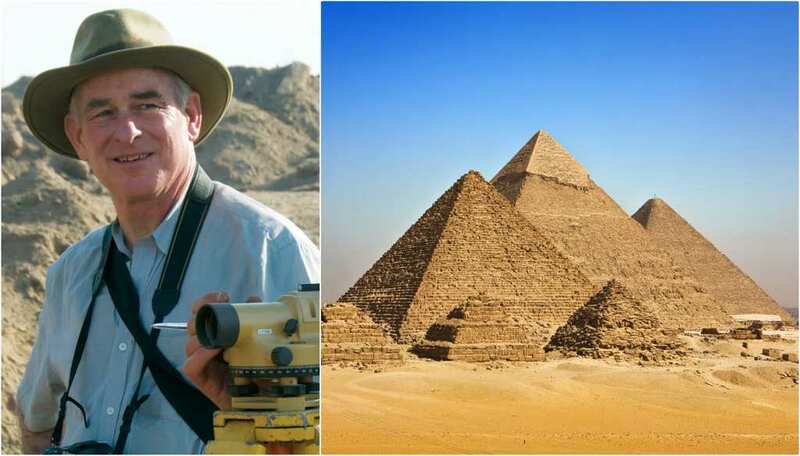 Did archaeologists just discover the mystery behind the pyramids? The Pyramids of Giza have perplexed historians and archaeologists for years. The monuments that include a King’s and Queen’s chambers and it was thought to have taken around 20 years to build them. There were many question around who built the pyramids for hundreds of years and archeologists could not seem to come to a consensus. However, a few archeologists have recently made a discovery that will answer all of the questions around the pyramids for good. 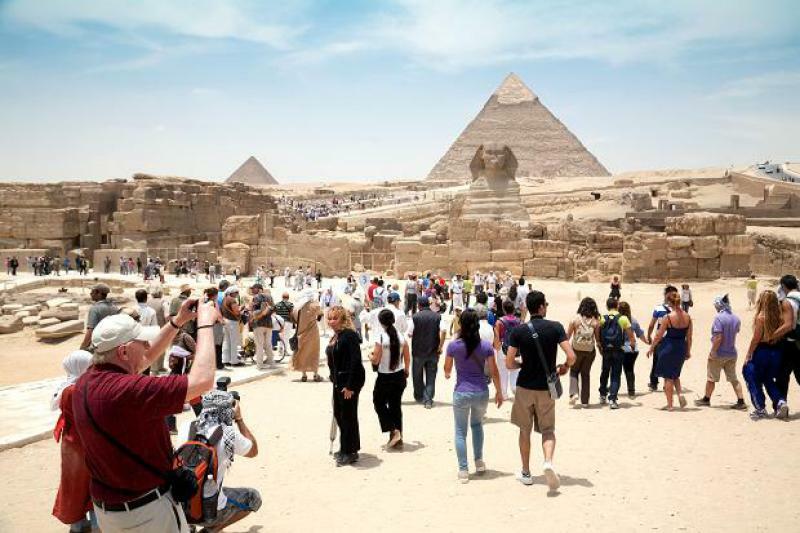 Over the centuries, the mysteries and legends surround the pyramids have captured the attention of millions of people. Archeologists and historians have even dedicated their entire bodies of work to unearth these ancient mysteries. Countless people have come up with theories about the methods used to create the pyramids that including the thought that the bricks were rolled, lifted or even dragged into place. One theory has stood out above all the rest and is considered to be the most convincing. Theorists in Ancient Greece theorized that the Egyptians used forced labor in order to construct the enormous monuments. For years following, this was the widely accepted theory, however, in recent years it has been suggested that the pyramids were actually built by skilled workers. 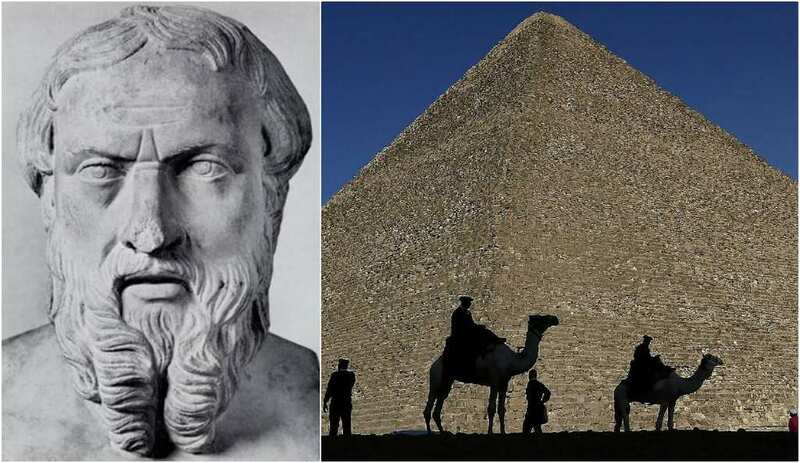 Diodorus Siculus and Herodotus were historians that wrote accounts on the construction of the pyramids. The latter penned a book on the subject in the 5th century. His theory proved that he was ahead of his time. Herodotus wrote his account of the construction of the pyramids around 1,600 years following their construction. Although his documents were written hundreds of years ago, they are still considered to have some of the most accurate information on the subject. It might be ancient, but it is still considered to be reliable. However, over the years, historians have become skeptical about Herodotus’ work and they believe it only offers one side of the story. There has been a consensus amongst historians and Egyptologists that the Pharaohs in ancient Egypt society ordered the construction of the pyramids. Like any other theory, there are conflicting ideas revolving around the way in which the pyramids were constructed. However, most of the theories all hold one construction method in common. Most believe that the laborers painstakingly used copper chisels to carve out the boulders needed for the pyramids. Some theorists believe that the bricks were then dragged into place. 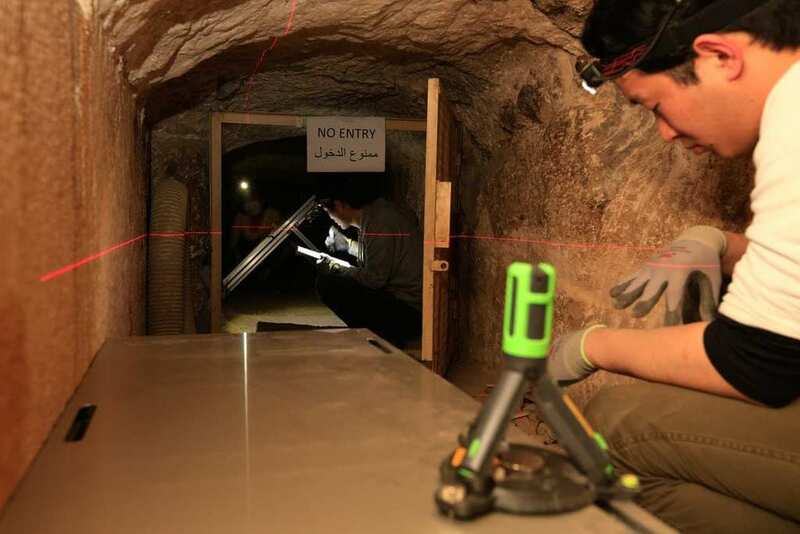 Theories about who built them still abound, with different experts still asking: was it really Egyptian workers who sweat and toiled over the pyramids? Many people are familiar with the “scientist” who has wild hair on the History Channel show, Ancient Aliens. This man is Giorgio A. Tsoukalos and he is a proponent of the idea that extraterrestrial beings interacted with humans in ancient times and played a role in building the pyramids. This theory is definitely out of the box and many historians have discredited it. However, some who believe in the theory claim that the pyramids align with Orion’s Belt. The mystery of who built the pyramids can even be dated back to Biblical times. 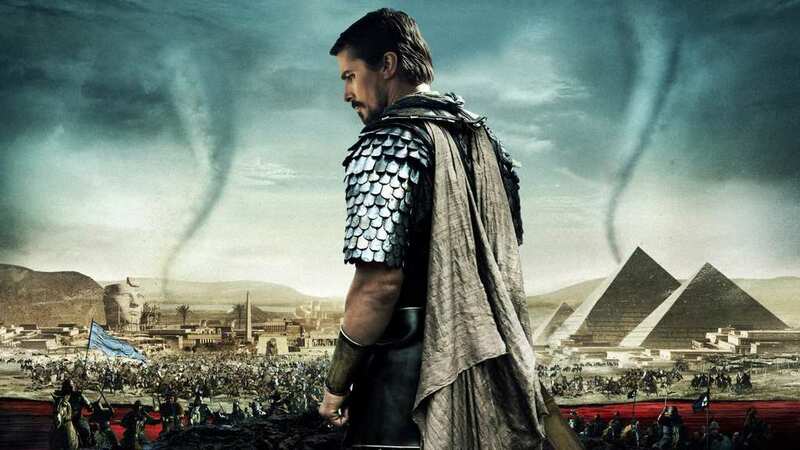 In the Bible, the book of Exodus discusses the enslavement of the Israelites in Egypt. 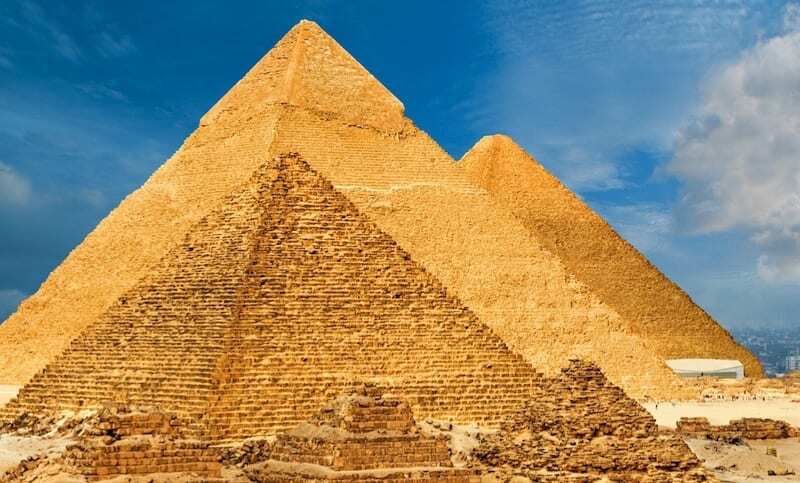 Although many people may assume that this means that the ancient Israelites were the builders of the pyramids, historians believe that this is a misconception. Archeologists believe that the pyramids were built around 2580 BC while the Israelites were not enslaved until the thirteenth century BCE. 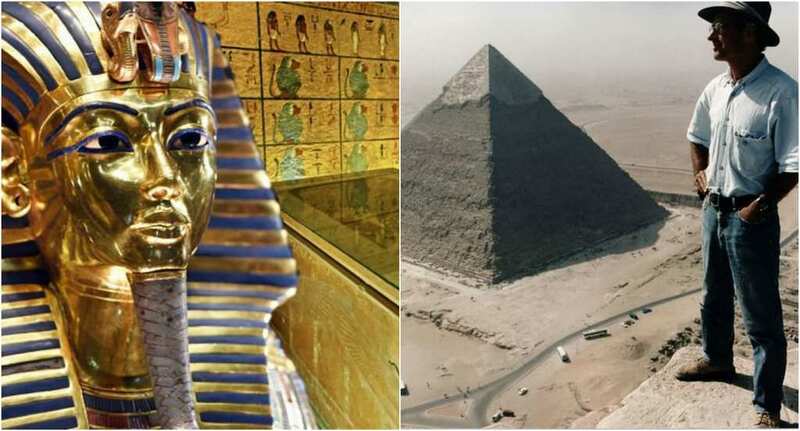 While there is a large amount of evidence that suggest the pyramids were constructed by the ancient Egyptians, some believe that they might have been built far before the time that the Pharaohs were alive. If this is the case, it would mean that these ancient structures would be much older than historians and archeologists have concluded. Cannon continued onto say, “Nobody knows who was there 12,000 years ago. 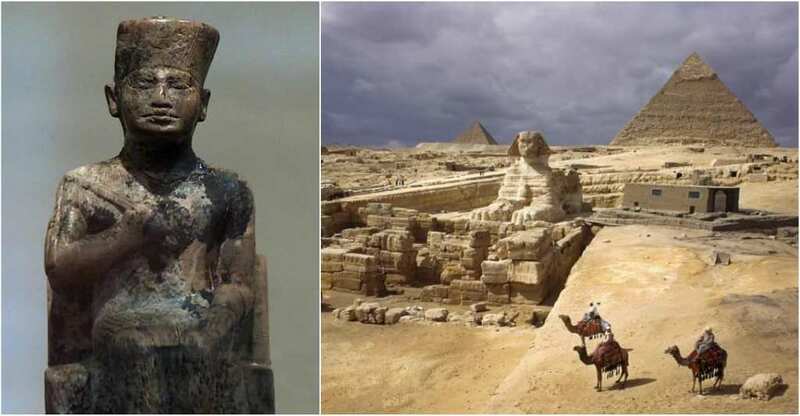 It had to have been done by a civilization that was more advanced than any of us.” Cannon’s and Hutton’s theory are quite out of the ordinary and they were shot down by many archaeologists and Egyptian authorities, however, there are other theories that have more credibility. 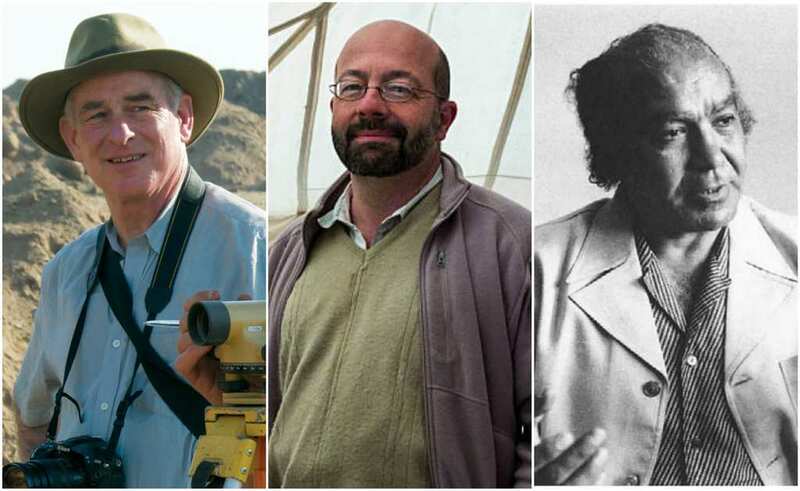 One particular Egyptologist named Miroslav Verner has come up with a theory that has made him one of the most respected people in his field. He theorized that it took more than one-hundred thousand men that were divided into a hierarchy in order to complete the construction of the pyramids. He claimed that men were divided into teams that suited their skills and then sub-divisions that were related to individual skills. Basically, he suggested that a pyramid of people was created in order to create the pyramids. Other Egyptologists have offered similar theories to Verner. 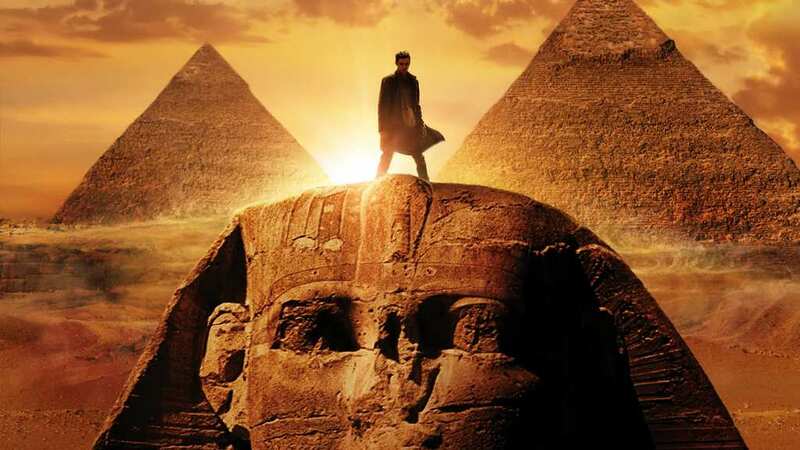 John Romer also agrees that the pyramids were meticulously planned out before the construction began, however, he goes one step further and claims that a life-sized plan was laid out in advance. Romer said, “Such a working diagram would also serve to generate the architecture of the pyramid with precision unmatched by any other means.” He also claimed that the plan alone probably took the architects around 15 years. 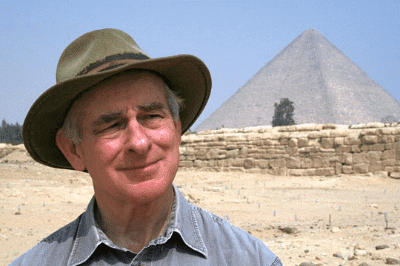 One of the most influential Egyptologists of the modern era is Mark Lehner. Lehner and his time put together a study that was one of the most detailed to ever be created. 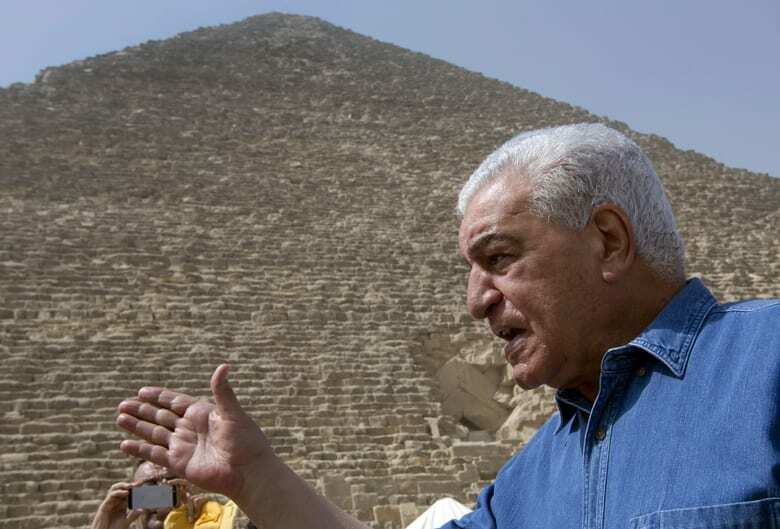 He has also introduced some new and fascinating theories revolving around the pyramids. Lehner does not agree with Verner that it took 100,000 men, but rather, he believes that it took somewhere between 15,000 and 40,000. When Lehner began his research, he did not anticipate how influential it would become. But what was the catalyst that triggered this onslaught of evidence. 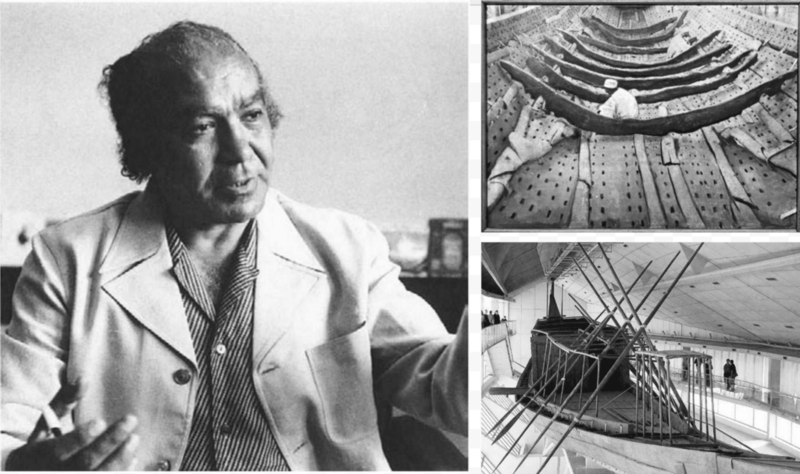 In 1954, and archeologist named Kamal el-Mallakh discovered a boat along with his team that they thought would have been used by Pharaoh Khufu. Only the remains of the boat, such as wooden planks, were discovered and restored in order to determine where they came from. After a scan was done on the planks, it was revealed that they would have been sewn to one another. But what was the purpose of the boat and did it ever take a trip on the Nile? It is believed by archeologists that the shipped was sealed in 2500 BC by servants and placed in a pit inside the Great Pyramid. It was intended to be used by Pharaoh Khufu in the afterlife, which is an idea that was accepted in Egyptian society. It is believed that it was designed to take the king on his eternal journey with the Egyptian Sun God, Ra. However, many theorists believe something else. Many theorists do not believe that the ship was intended for the afterlife as it was believed by many that the ship had already taken a trip in water. This caused so historians to theorize that the ship was used in order to transport the mummified body of the king to his resting place. 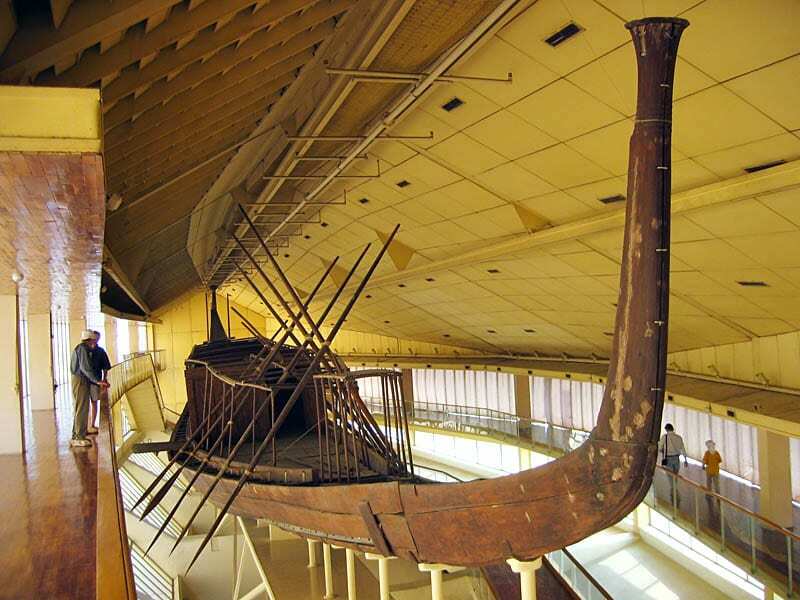 Another theory was that Khufu used the ship while he was alive to travel to holy, Ancient Egyptian sites. To this day, this ship is regarded as one of the most significant discoveries in the world of Egyptology. So now that we have discovered the theories about who built the pyramids, we need to find out why they were built to begin with. According to most Egyptologists, the Great Pyramid was intended to house the body and the possessions of Pharaoh Khufu. It is speculated that the smaller pyramids in front of the the Great Pyramid was intended for Khufu’s wives. Although this is the most widely accepted theory, there are other thoughts around the purpose of the pyramid. 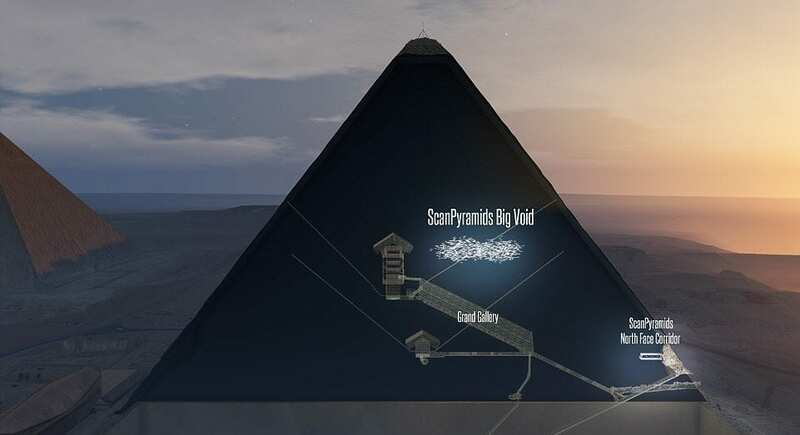 A fascinating discovery about what is inside the Great Pyramid has recently been made that puts all of the other theories into question. It took a lot of scanning inside the structure for scientists to discover a void inside. There is a 30 meter long chasm that is located directly above the queen’s resting place. When it was discovered, no one knew what it was for, however, there are many theories about what it may have been used for. There are two theories that oppose each other surrounding the purpose of the void. The first theory suggest that the void is nothing out of the ordinary and it was simply put in as a “construction gap,” meaning that builders used it as a platform to get from one room to another. 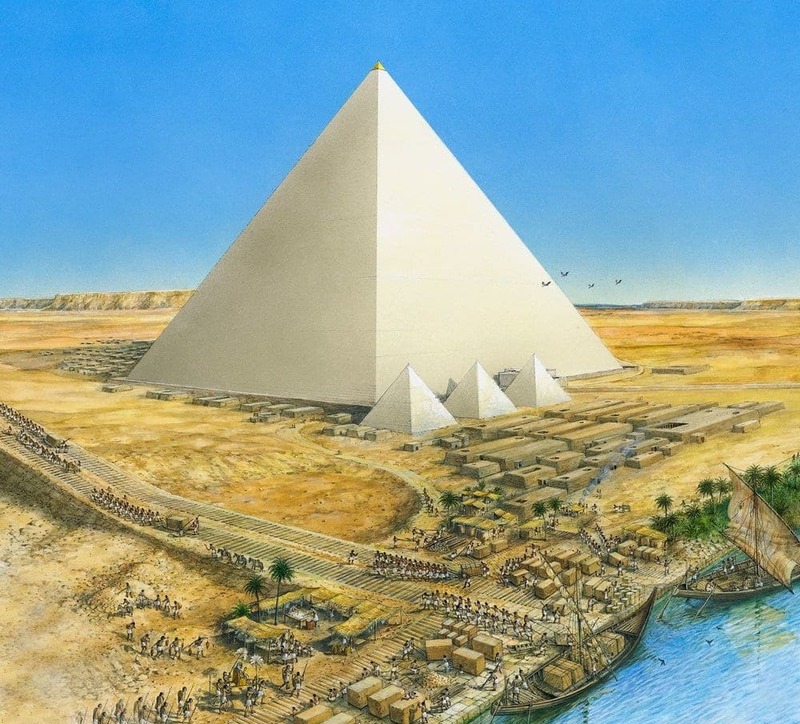 Although the Great Pyramid was built in ancient times, it was highly sophisticated. It was found that there are three chambers within the structure and the lowest one is in the bedrock. Above that are the king’s and queen’s chambers and surrounding them is the exterior. 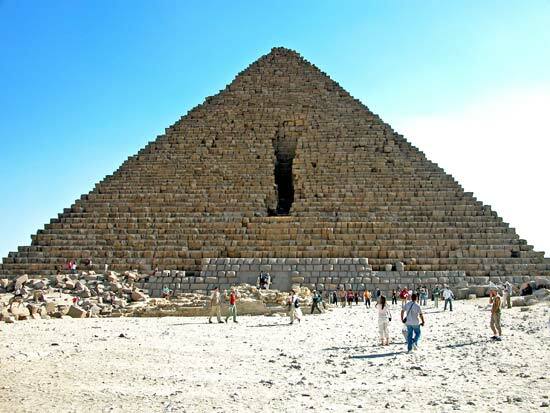 The pyramids of Giza include 2 mortuary structures that were built to honor the Pharaoh. There is also another pyramid that is surrounded by tombs. 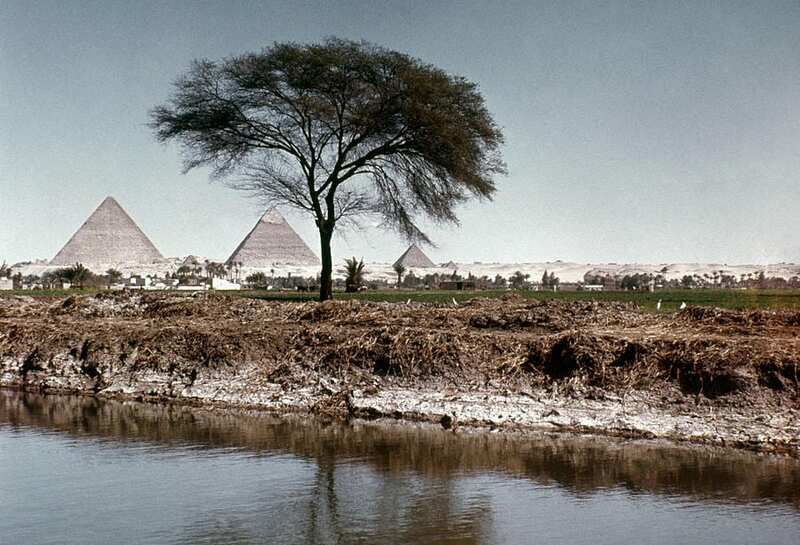 One may assume that the reason why the pyramids were built in close proximity to the Nile was due to the need of the civilization to be close to water. 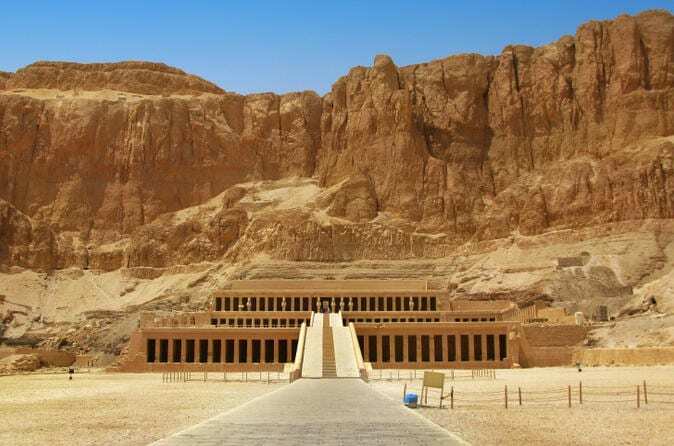 However, after a lot of research was conducted around Ancient Egyptian civilization, it is now believed that another reason is because the sun sets on the west bank of the river. This is where the pyramids were located and it was supposed be a symbol for the world of the dead. From researching more about the pyramids, archaeologists have discovered how far ahead of its time Egyptian society was. Two examples of this are located in the construction of the pyramids. Firstly, archeologists discovered that the builders set up a system to avoid damage to the structure from earthquakes using a ball and socket. Secondly, they were designed in a way to keep out the harsh heat and the inside remained around twenty degrees Celsius. 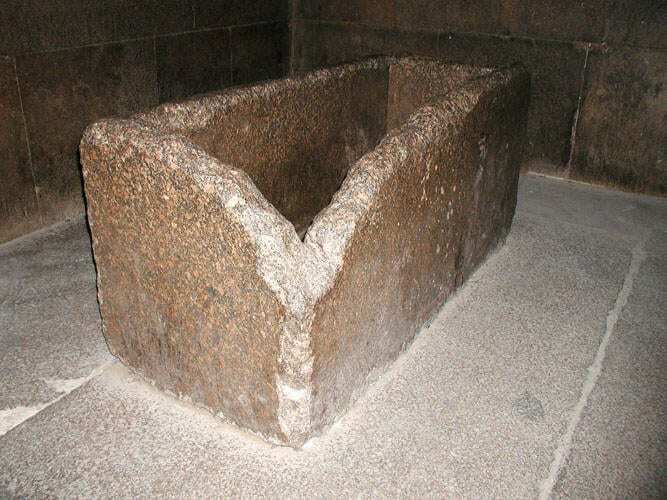 Another discovery that was made inside one of the chambers of the Great Pyramid was a coffer (a small chest for valuables). While at first glance it seems to be a completely normal addition to the chamber, upon closer investigation it was discovered that the coffer was made from granite. Based on the size of the passageway that leads into the chamber, it would have been impossible for the coffer to fit though. This would suggest that the pyramid was built around the coffer. What held the stones together? Another mystery surrounding the pyramid was the material that held the bricks of stone together. Until this day, no archaeologist has been able to properly identify the material that was used to make the motor that bonded the stones together. The only thing that archeologists are certain of is the chemical makeup of the mortar. However, they have not been able to recreate the motor. It is believed that the material needed to be harder than the stone in order for it to work. In addition to be a tomb for the dead, it was clear that the Great Pyramid was an expression of the power of ancient Egypt. What ever theory you believe in, one fact is undeniable, no tourist can resist the appeal of the pyramids. 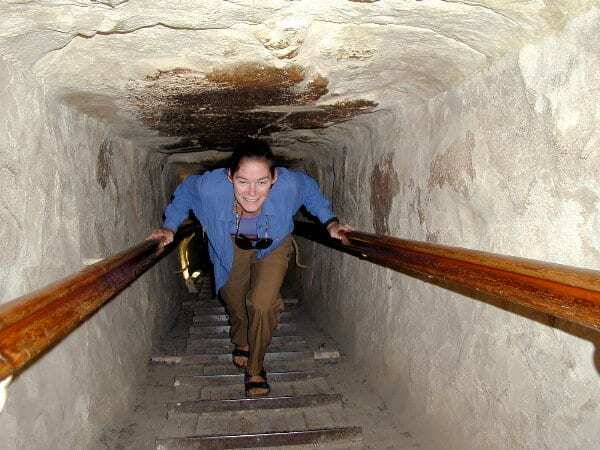 If you are not a highly respected Egyptologist that studies the Pyramids of Giza for a living, you are likely a person who is interested in the history of the pyramids. This, in addition to the mysteries surrounding the pyramids, is why over 5 million visitors every year flock to Egypt to see the monuments for themselves. The Great Pyramid holds the title of being the last surviving Wonder of the World, of which there were 7. So what were the other wonders? 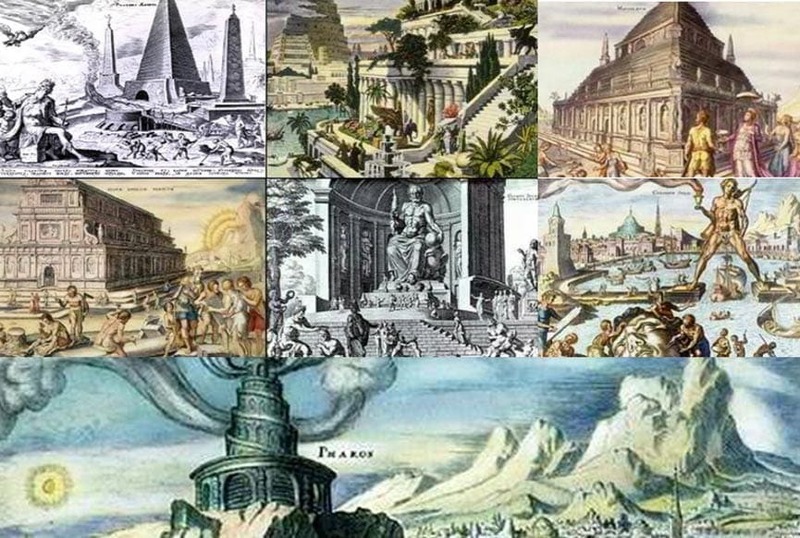 According to most historians, the 6 wonders that have unfortunately been lost to the hands of time include, the Lighthouse of Alexandria, Colossus of Rhodes, the Mausoleum of Halicarnassus, the Olympic statue of Zeus, the Temple of Artemis, and the Hanging Gardens of Babylon. While the mysteries of these wonders may be hard to uncover, have historians uncovered the mysteries of the last remaining wonder? A remarkable discovery was made in 2013 that would prove the theories of some historians and change the minds of others. 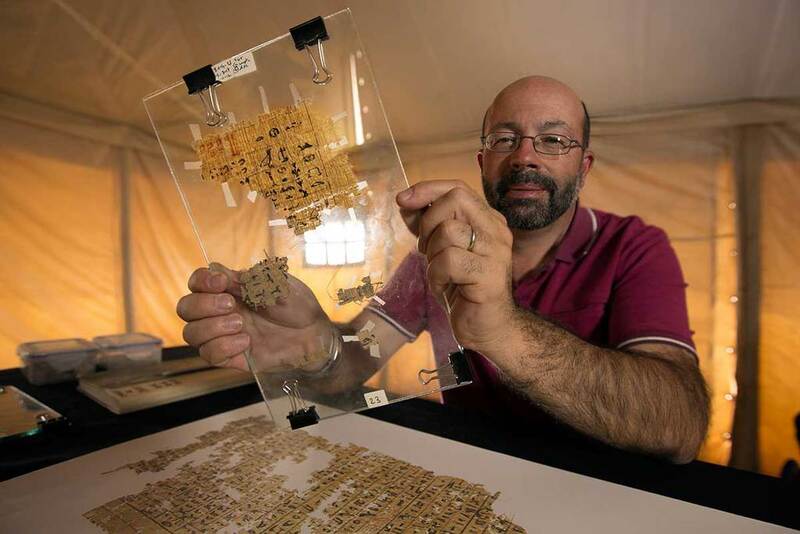 A papyrus made approximately 4,500 years ago was found in a Wadi al-Jarf. The papyrus was a text of hieroglyphics that seemed to outline the plans for the construction of the pyramids. While these plans were once merely a theory, archeologists are now able to confirm them as a fact. So who made this historic discovery? Pierre Tallet was the man who discovered the long theorized papyrus. 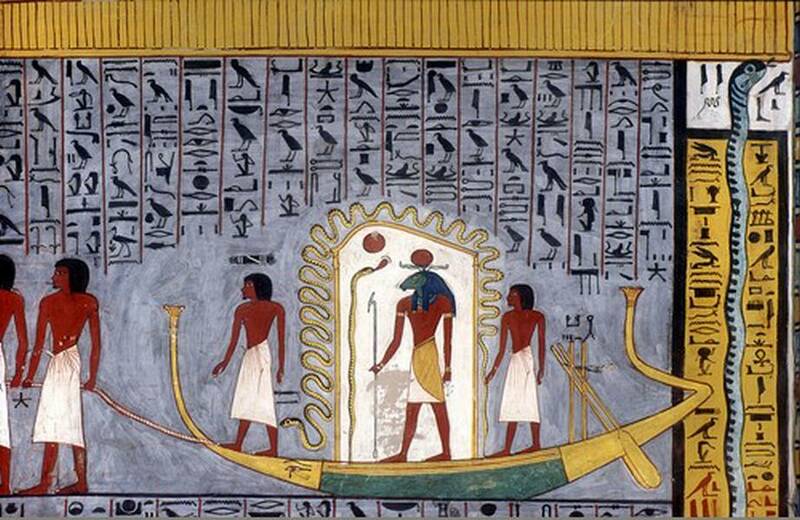 Since Tallet made the discovery, he has been working to decipher the hieroglyphics on the papyrus. 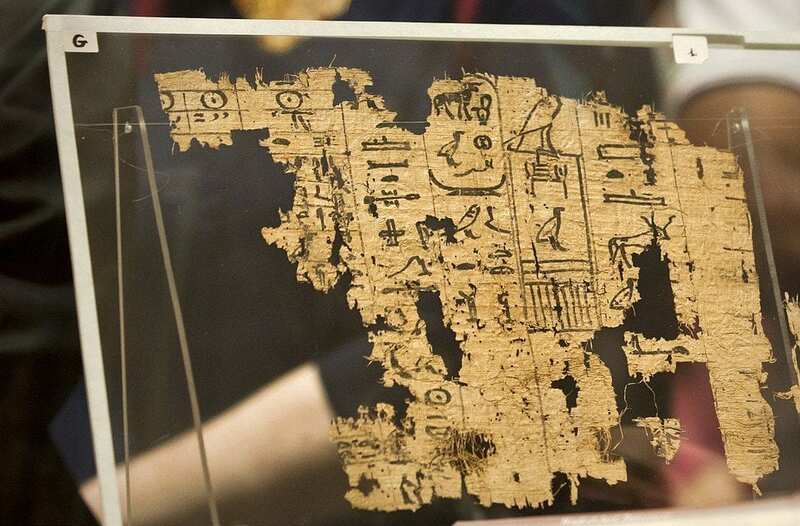 Tallet said, “Since the very day of the discovery, it was quite evident that we have the oldest papyrus ever found in the world.” With his astonishing discovery, Tallet was aware that he had changed Egyptology forever. So what was written on the papyrus? The document was written by an ancient Egyptian citizen named Merer. The document confirmed many theorist’s beliefs that the pyramids were built by skilled workers and engineers. The document also stated that these workers used boats as a mode of transportation for the limestone that totaled more than 170,000 tons. The stones made the journey on the Nile from Tura to Giza where the pyramids stood. Finally, there was a document proving the theories that had been suggested for so long. It also gave one more detail that made the pyramids even more staggering than once thought. Merer also wrote about a canal system that no archeologist had theorized about. It was revealed in the papyrus that engineers constructed man made canals to make it easier to transport building materials. The canals started directly at the Nile and stretched to the area where the pyramids were built. So where did these building materials originate from? In addition to revealing how the pyramids were constructed, Merer also explained who was behind them. In addition to revealing information about the pyramids, Merer also detailed important information about Pharaoh Khufu. The construction of the pyramids was overseen by Khufu’s half-brother, Ankh-haf. He was also a Vizier to the king in addition to being his family member. The text goes onto say that it was Khufu himself who told engineers to cover the pyramid and his future tomb in limestone. Although Tallet was the person who discovered the papyrus, he had some help from a colleague. While Pierre Tallet made the discovery of the papyrus, Mark Leher collaborated in order to prove the document to be accurate. 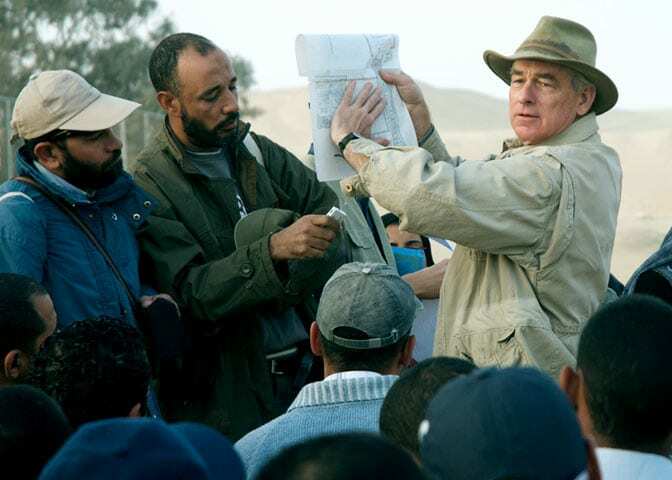 Along with his archaeological team, Leher was able to discover the lost waterway. 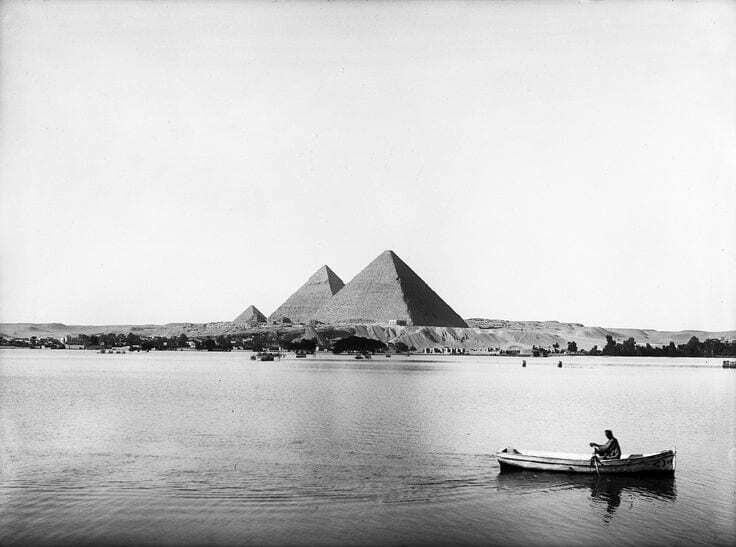 He stated, “We’ve outlined the central canal basin which we think was the primary delivery area to the foot of the Giza Plateau.” The origins of the pyramids was now proven by Merer’s documentation and the research of modern historians. But did the public believe them? Lehner and Tallet were able to prove to the public a theory that had only been speculated in the past. Because of the document written by Merer, the theory that the pyramids was actually built by skilled workers was able to be proven. Historians and archeologists were also able to understand how materials were moved from place to place and a reason was given for how the heavy limestone could have been transported. 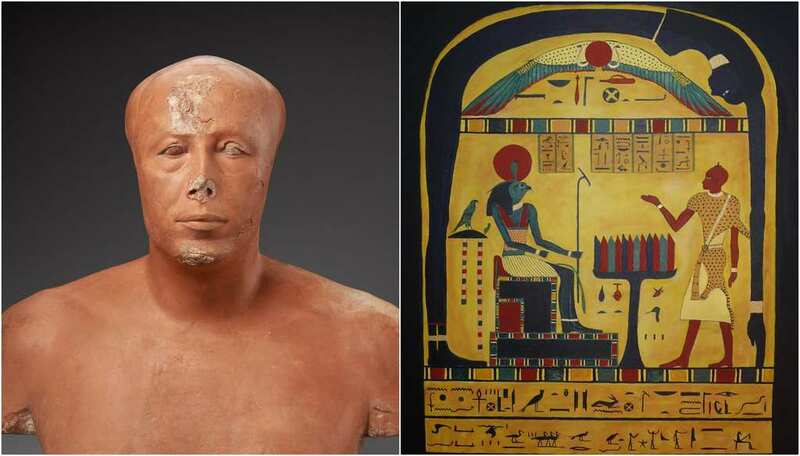 These findings add a new layer to the theories that have been offered by Egyptologists such as Gerry Cannon, Verner and Miroslav. 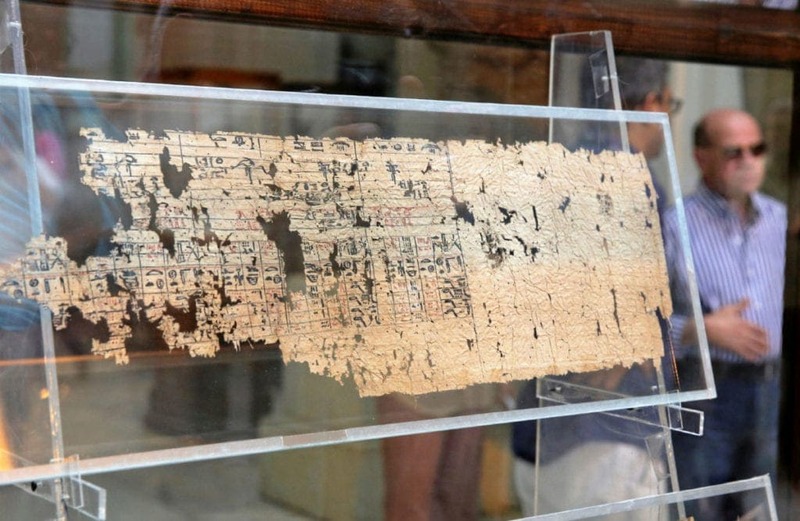 Although there have been many new discoveries over the years and this Diary of Merer has changed the face of Egyptology, archaeologists will continue to research the hidden mysteries of Ancient Egypt. 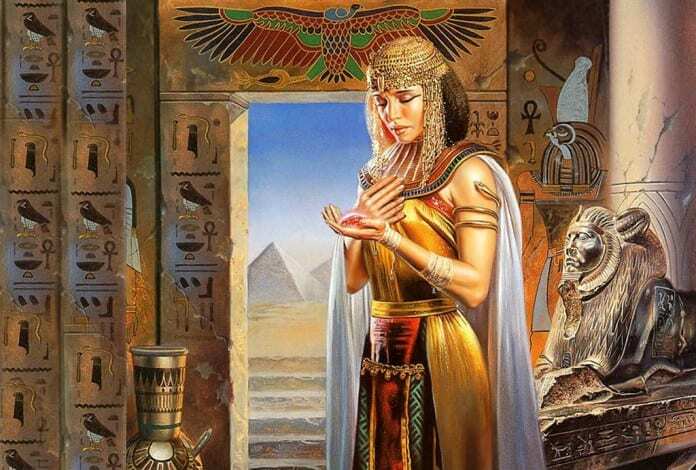 Although there is much more to be discovered, this is one mystery that has been solved due to the hard work of researchers in the field of Ancient Egypt. A lot of people think that pyramid building was only a phenomenon seen in Ancient Egypt. 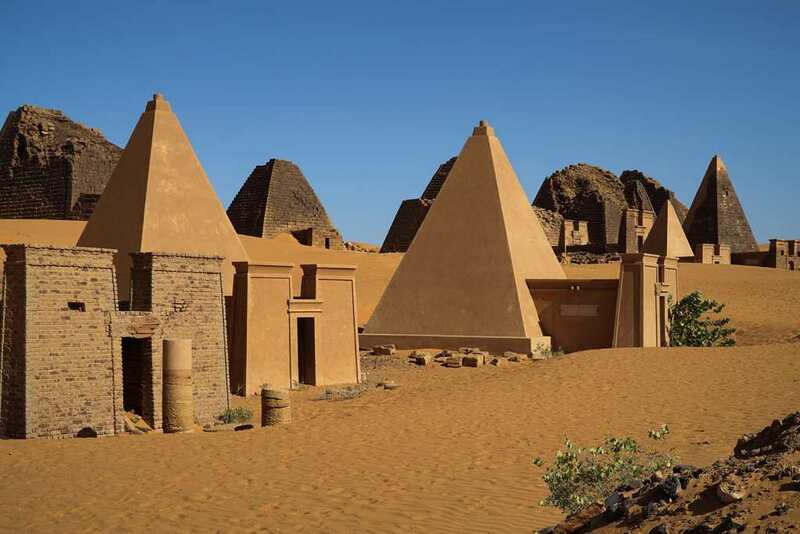 But in fact, the country with the largest number of pyramids is not Egypt, but present-day Sudan, whose pyramids were built by the rulers of the Nubian Kushite kingdoms. The rulers of these kingdoms, which spanned from 2600 BCE to 300 CE, were also all buried in pyramids, taking after their Egyptian cousins. The Kushite pyramids, however, were tiny in comparison. When we think of the pyramids today, we typically think of old, dusty, blocky structures in the middle of sandy expanses. But that is not how they were for the first thousand or so years after they were built. 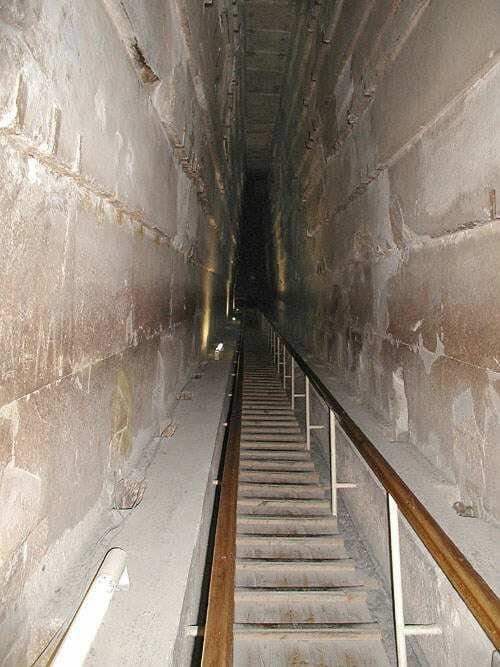 The pyramids actually had a white, polished layer of limestone covering them. This made them actually really hard to look at during the day due to how brightly they reflected sunlight (and even moonlight). But the coup de grace on top of the pyramids? A giant, gold capstone. Why aren’t there more of them? 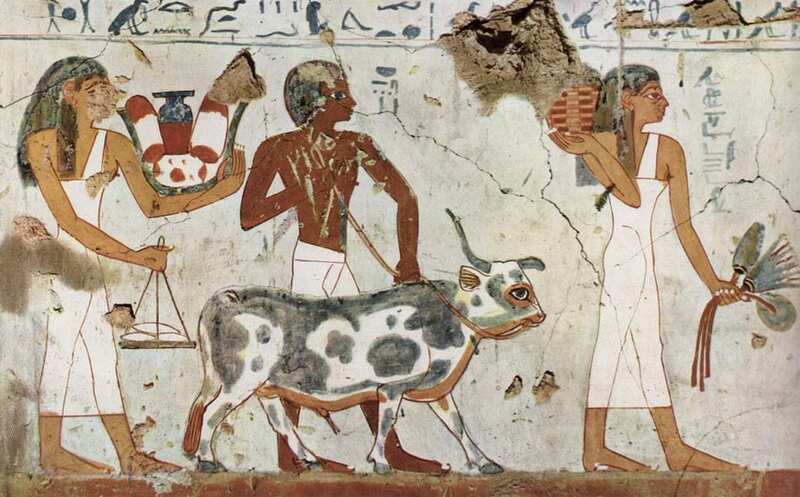 The Kingdom of Egypt lasted for thousands of years and had hundreds of rulers. 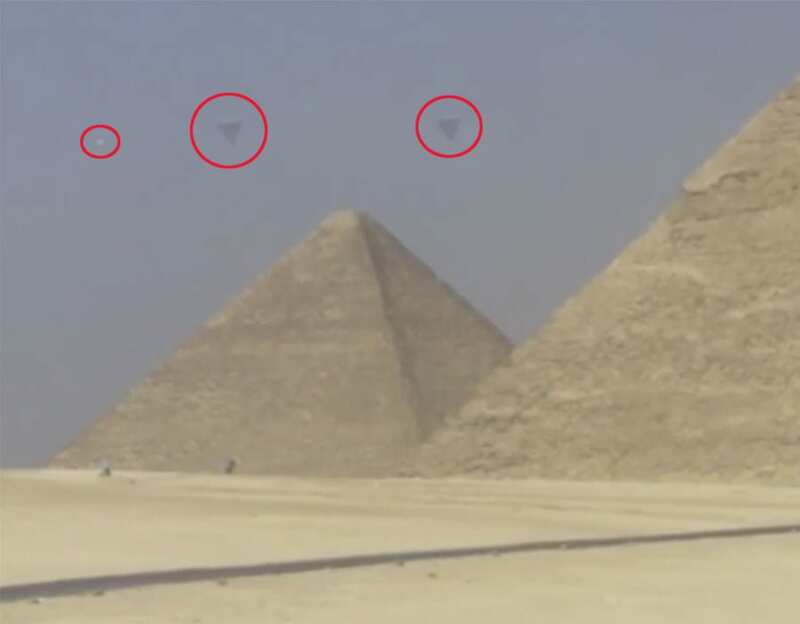 And yet, we only see about 80 of the structures scattered around Egypt. 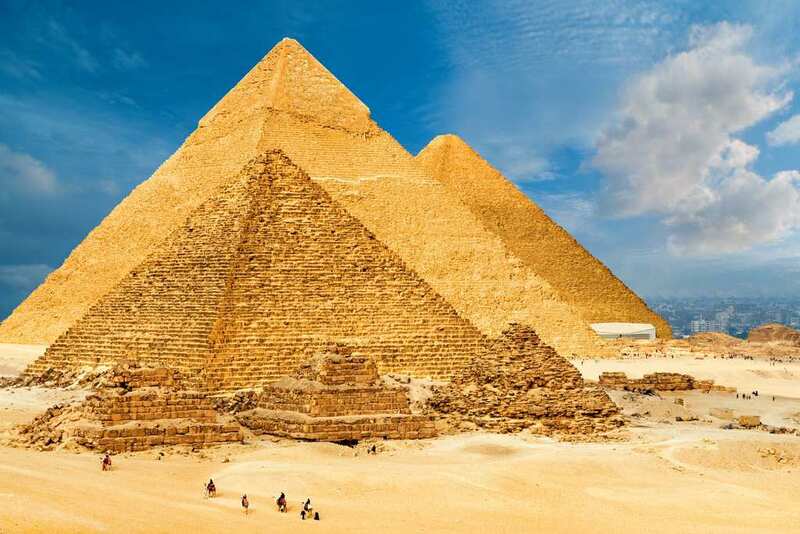 Believe it or not, one of the things that helped Ancient Egypt become one of the world’s first superpowers was the construction of these colossal pyramids. 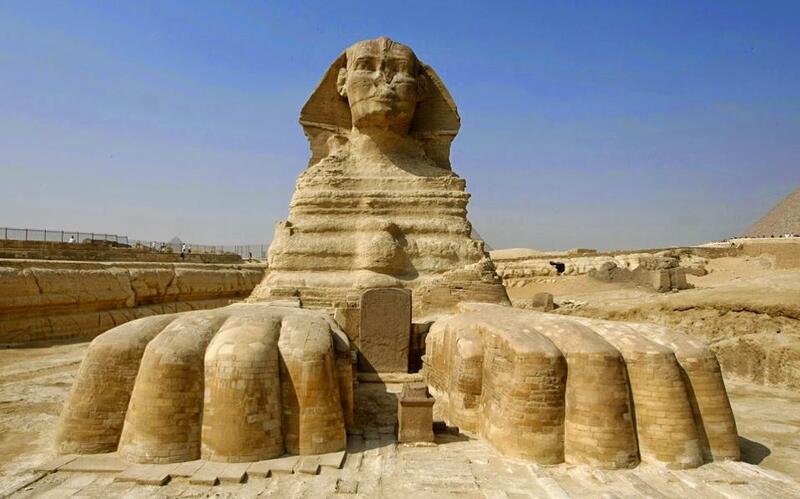 In order to build these insanely huge structures, the Egyptians needed money. To get this all important cash, they expanded their empire to tax more people, grow more crops, and sell more products. They also traded far and wide in order to get the raw materials needed to build these enormous tombs. When Europeans first saw the pyramids in Egypt during the dark ages, they had no idea what they were or why they were built. Christian monks from the 500s CE and onwards believed that the pyramids were actually the ancient granaries that the biblical Joseph built for the pharaoh to stave off a coming famine. 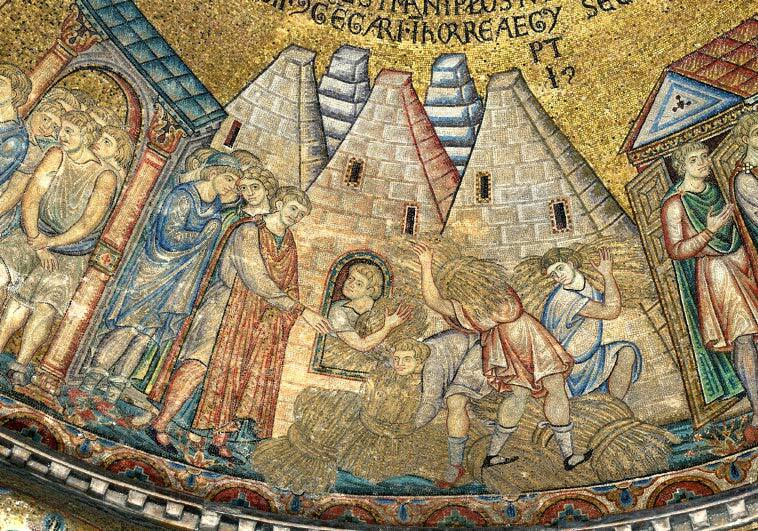 In fact, if you go to cathedrals in Venice, Italy built around the time of the Renaissance, you can see images depicting the story of Joseph, specifically people storing grain in the pyramids! Standing at over 481 feet tall, the building is enormous, and was certainly a feat of ancient engineering. 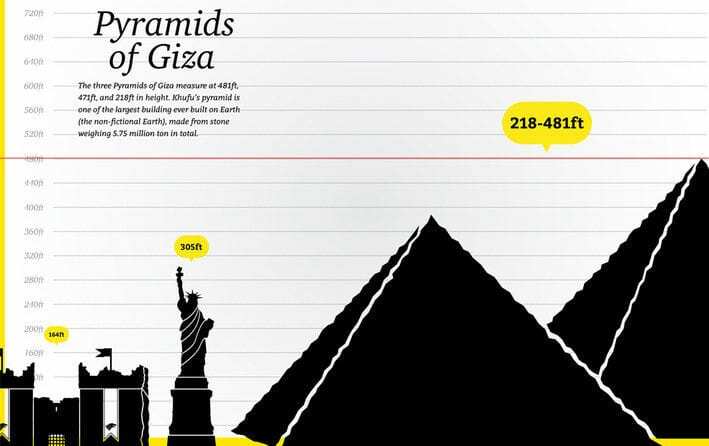 In fact, it was actually the tallest manmade structure in the world, for a very long time – the Great Pyramid of Giza held the title of the “world’s tallest manmade structure” for over 3,870 years. Humans would only build a taller structure in the year 1311 – the Lincoln Cathedral in Lincoln, United Kingdom. One thing that is interesting about the entire Great Pyramid Compound in Giza, Egypt is that the entirety of the compound is located on the western bank of the Nile River. 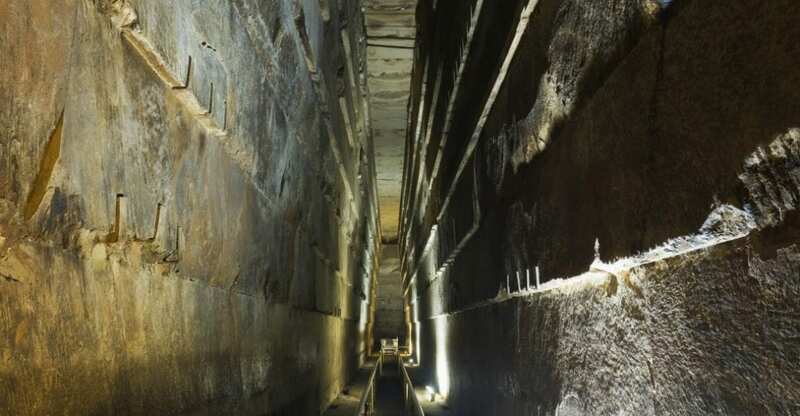 Egyptologists believe that the reason for this placement is because the west bank of the Nile River and beyond was considered to be the “Realm of the Dead,” as that is where the sun sets. 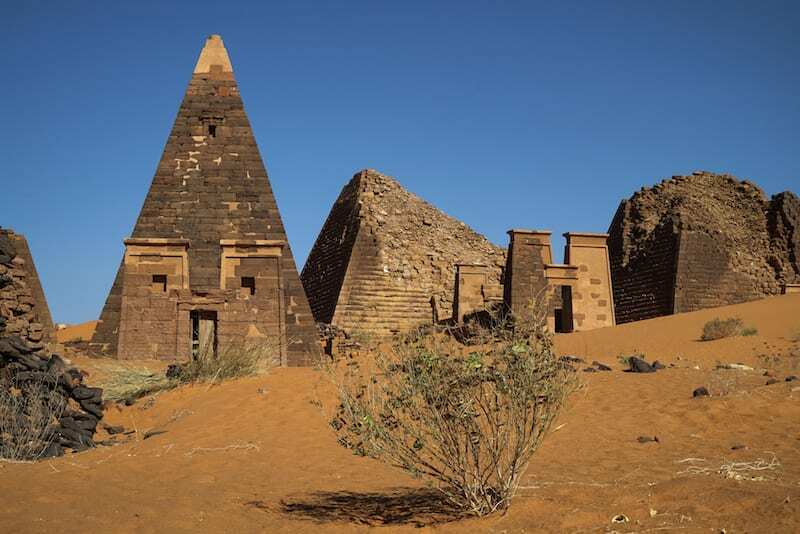 It would only make sense to put these massive tombs in an area associated with the afterlife. 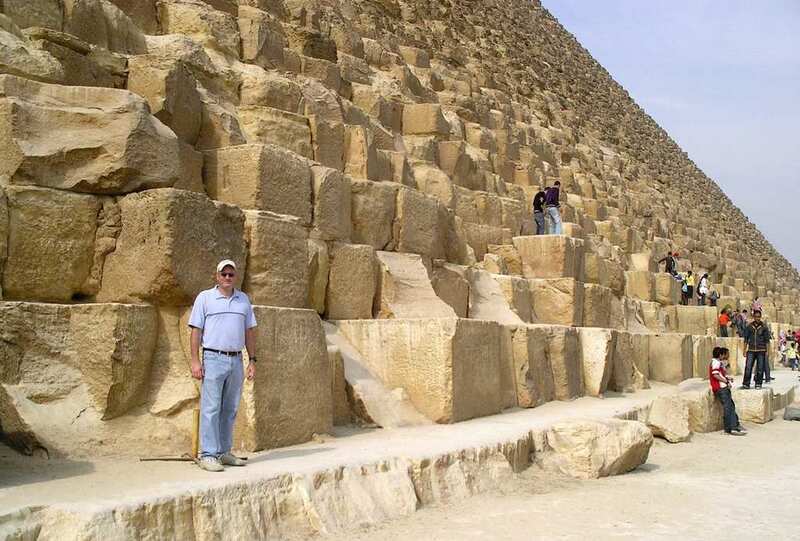 If you look at the entryways to the pyramids of Giza, you can see that there was once space for a giant block of stone. 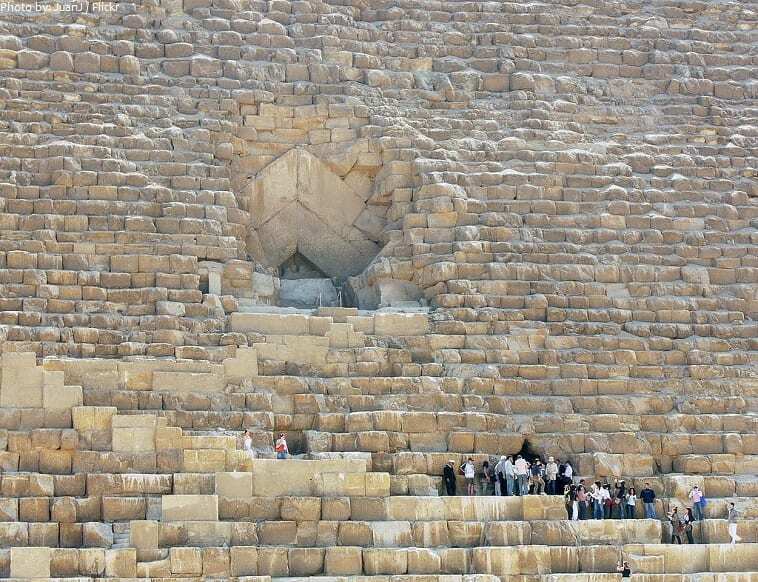 That block of stone was actually the door to the pyramid, and it was an engineering marvel. 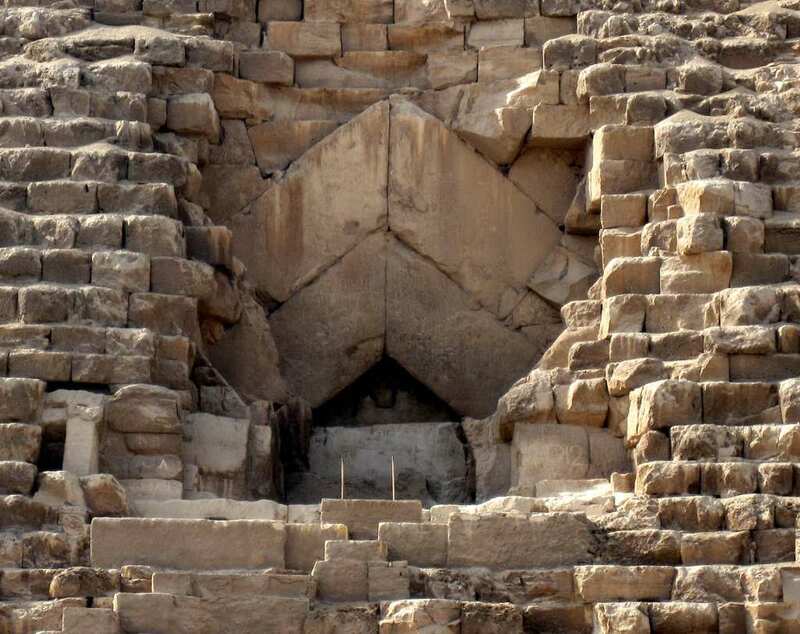 The door would have weighed several tons in order to protect the pyramid from intruders, but when unlocked, there is evidence to suggest that it was on a hinge that would have made opening the door a piece of cake! How many sides does a pyramid have? Well, if you answered four, you would be correct when describing a standard pyramid. But for the Great Pyramid in Egypt, this answer is a little bit more complicated. 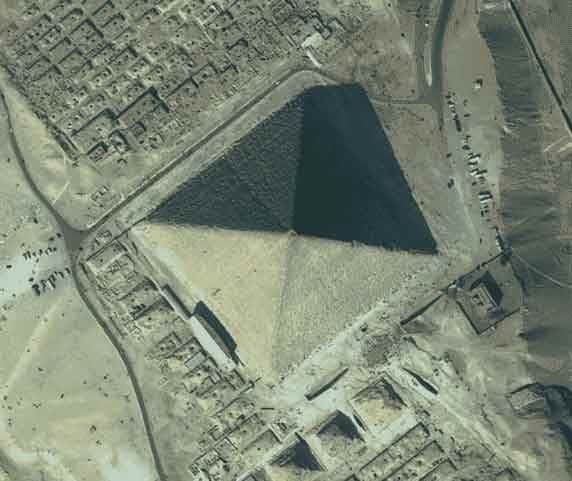 When seen from above, it appears as if there is a line running down the middle of the sides of the pyramid. Does this mean that there is actually a little indent, suggesting eight sides? Is it just erosion? Or is it all a trick of the light? After Saladin drove out the invading crusaders from the Middle East, he decided to divide up his holdings amongst his sons. 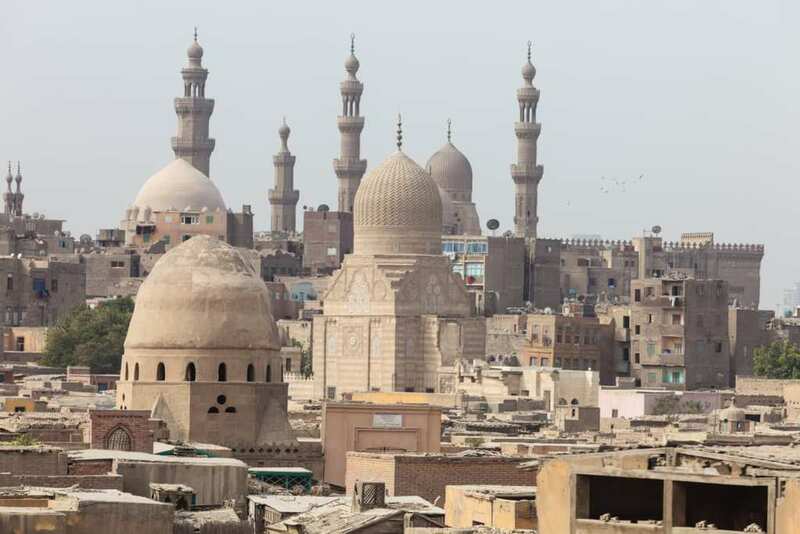 His son Al-Malik al-Aziz Uthman was given control of present-day Egypt, and he decided that he would make the area more Islamic – specifically by destroying the pyramids. However, the pyramids were built so well using such heavy stones that Al Malik al-Aziz had to give up on the endeavor in the late 1100s CE. That is why there is a giant gash in the Pyramid of Menkaure. The stone blocks used to build the pyramids are enormous, and have contributed greatly to the longevity of the structures. In fact, this is what ultimately saved them from destruction by various caliphates as well as father time himself. These stones are giant, with the lightest of them weighing two tons! There are also many other blocks of stone that are much heavier, coming in at 10, 20, and even up to 50 tons! 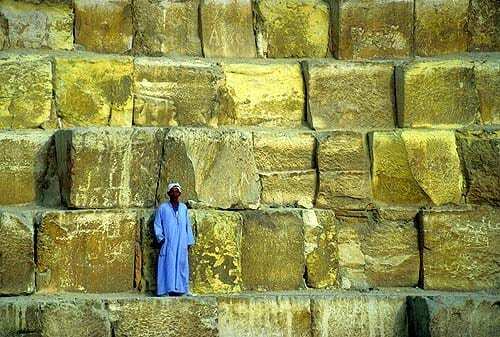 Despite the fact that these stone are giant and have been around for the vast majority of human (written) history, it turns out that the pyramids have indeed shrunk quite a bit since they were first constructed. This is not necessarily because of looting or from people taking off pieces of the monument as souvenirs, but because of erosion. After over 4,000 years of rains, nature has shaved a two and a half story section off the pyramids. 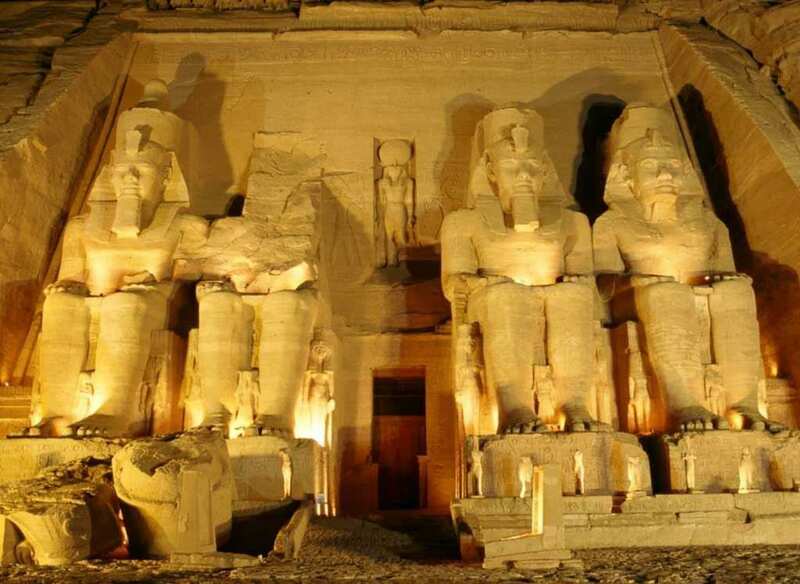 If you were to go to the Great Pyramid of Giza now, you may expect to see the riches of the pharaohs sitting there for all the world to behold. In such case, you’ll probably be disappointed to find out that these ancient burial structures, are, in fact, quite empty. There are not even that many hieroglyphics! This is because tomb raiders have raided the pyramids hundreds of times over the past 4,000 years, taking anything and everything of value. If the pyramids were supposedly so bright and made out of such rich and polished limestone, then where did all of that limestone go off to? To find out, all you need to do is cross the Nile River and go to Old Cairo. When the city was first constructed back in 969 CE, the builders wanted to cover the buildings in beautiful limestone. So, they took the limestone covering the pyramids and repurposed it as building material for their homes. We all know the pyramids in Egypt are old. We know for a fact that they are over 4,000 years old. But what does that mean, 4,000 years? It is a long time, but it needs to be put into perspective. For instance, when we think of Ancient Rome today, we think of their stuff as really, really old – and that was 2,000 years ago. That means that they pyramids were as ancient to the Ancient Romans as Ancient Rome is to the present day!